Photo: Some of the children who are enrolled in our after-school care program which provides them with new clothing, hygiene items, snacks, tutoring, and a fresh-cooked dinner each weekday. We are happy to report that our new Children’s Hope Center on the island of Cebu has been operating smoothly since it opened during the second week of March. 34 children (ages 5-14) are enrolled in the Hope Center’s after-school care program which includes homework tutoring for the subjects they are studying in school — English, their native Filipino language, science, math, geography, history, and civics — and other activities, along with snack and meal services for children suffering from extreme poverty. The program model has proven highly effective; this is our 5th Children’s Hope Center launch — the Hope Center model was first established in 2011 by our India team in the slums of Hyderabad, South India. The Cebu program is held in a new multipurpose facility on our main campus we’ve been slowly working on for about a year now. In other good news, construction is almost complete on a new bathroom at the Hope Center. This is a great blessing because now the children will have their own private restrooms. With your support we are seeking to make other improvements to the Hope Center to further improve the lives of these children. We would like to purchase 3 more study tables, a chalkboard, and a complete hygiene kit for each child — each kit includes a towel, a washcloth, soap, shampoo, a toothbrush, toothpaste, a comb, rubbing alcohol, deodorant, baby powder, mouthwash, lotion, Kleenex, and a water bottle. Our recently expanded piggery is currently housing 6 mature pigs and 4 piglets. This micro-venture at our farmland is a valuable source of income for us since each healthy, mature pig sells for $175 at market. We also recently launched a free-range poultry farming project at our farmland enterprise — it includes 45 mature ducks, 16 ducklings, and 40 chickens, which are all in strong demand at the local market as well. They are easy to maintain and care for, so they will multiply quickly, yielding higher profits from our future sales. The poultry is also a healthy addition to our children’s diets, giving them a nourishing source of protein. 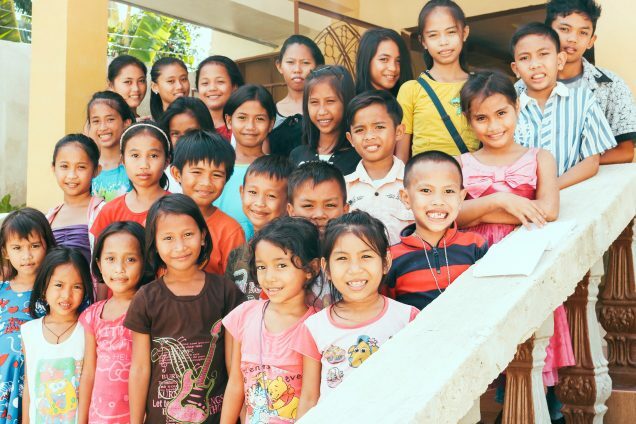 Photo inset: (Top-left): These children are thankful to benefit from the after-school care program at our Children’s Hope Center on the island of Cebu. 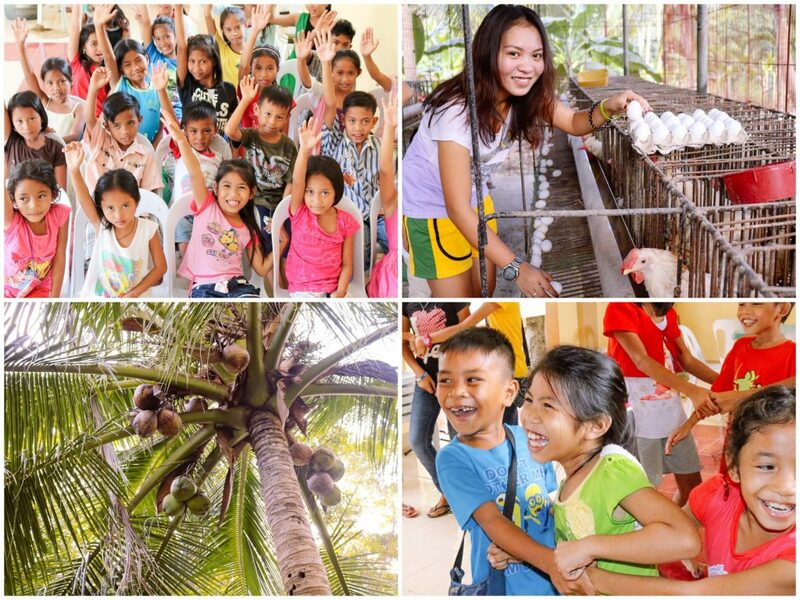 (Top-right): This girl is thankful to gather an abundance of eggs daily from our hen house project. (Bottom-left): Our 85 mature coconut trees are harvested 3 times annually — we reap a harvest of over 1,400 coconuts per year. (Bottom-right): In addition to tutoring and help with their homework, children attending the Hope Center program also enjoy playing games and other activities. In pursuit of our sustainability goals, our team has also maintained a hen house project which currently consists of 144 hens that produce between 120-300 eggs per day. We expect production to increase as our newest batch of young chicks grow and mature. Things are also going very well at our two fishery ponds which are currently stocked with around 8,000 healthy fish. The main concrete-lined pond holds a volume of approximately 20,000 gallons (75,000 liters) of fresh water pumped from our on-campus well. The supply of fresh fish vastly supplements the nutrition of our students and children in our outreach programs. Our coconut grove is flourishing with 115 trees, including 30 new coconut trees which we planted 4 months ago — the new coconut trees will mature in 7-8 years. Our 85 mature coconut trees are harvested 3 times annually — we reap a harvest of over 1,400 coconuts per year. The younger coconuts are used in the children’s diets — after the nuts are opened, the soft sweet meat is delicious to eat, and the juice is refreshing and hydrating. Coconut milk, made from the meat of coconuts, is full of every good thing the body needs to survive including vitamins C and E, many B vitamins, and magnesium, potassium, phosphorous, and iron. In further good news, our banana grove is also flourishing with 78 banana trees, and we look forward to a bountiful harvest of bananas in September. All of these efforts not only aid in providing nutritious ingredients for our children’s meals, they also help diversify and increase profits, empowering our local team to reach even more children.